Grace the Staffie almost learned the hard way how curiosity killed the cat, when she poked her inquisitive nose into a fox’s lair. 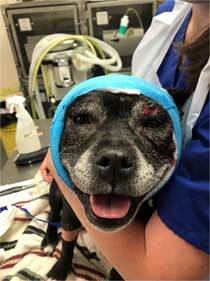 The vet who treated the seven-year-old Staffordshire Bull Terrier that received deep wounds around her face, ears and eyes after coming face to face with the resident fox is now urging dog owners to be more vigilant when they are off their leads. He took Grace to Cherrydown Vets’ Basildon branch, where Amy Andrews treated her wounds which resulted in Grace having part of her ear removed, but she has since made a full recovery. Amy said: “It appears that Grace had put her head down the entrance to a fox’s den and was savaged by the occupant. “When I saw her, her face was dripping with blood but, despite that, she was an absolute sweetheart and very loving as I treated her, even when I had to remove part of her ear. “However, her experience serves as a warning to dog owners to be on the alert when exercising their pets off the lead. Dogs are naturally inquisitive and will stick their heads down any interesting hole or burrow without being aware of the potential dangers of doing so. Zane said Grace was back to her normal, enthusiastic self within three days of the incident.